If your principal work is for motion pictures, then this meter is a "must" for you. No studio or movie unit can afford to be without a PROFESSIONAL. This meter features a complete set of ASA slides calibrated at 1/50 sec., corresponding to the normal speed of professional motion picture cameras. 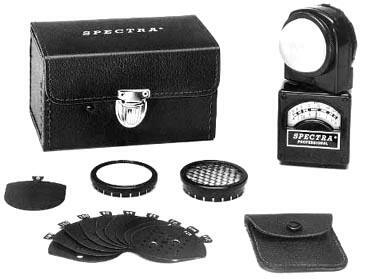 Accurate and reliable, the SPECTRA PROFESSIONAL is accepted as the "standard" for the motion picture cameraman. METER SCALE: Footcandles and f/stops. Reads f/stops direct when ASA slide is inserted. EXPOSURE RANGE: From 1/4000 second to 8 minutes. Film exposure indexes from ASA 0.1 to 32000; f/stops from 0.5 to 45. DISPLAY RANGE: ISO: 3 to 8000 in 1/3-stop increments. FRAMES PER SECOND: 2 to 360 (for motion picture cameras). Exposure time: 1/8000sec to 30 minutes. LIGHT MEASUREMENT: Incident or reflected light with exclusive snap-on attachments. SWIVEL HEAD: Assembly turns 270 degrees. METER PACKAGE INCLUDES: ASA slides, PHOTO-SPHERE, PHOTOGRID, PHOTODISK and neck strap in carrying case. Pointer lock options at small extra cost. DIMENSIONS: 4-1/2" X 2-1/8" X 11/4"